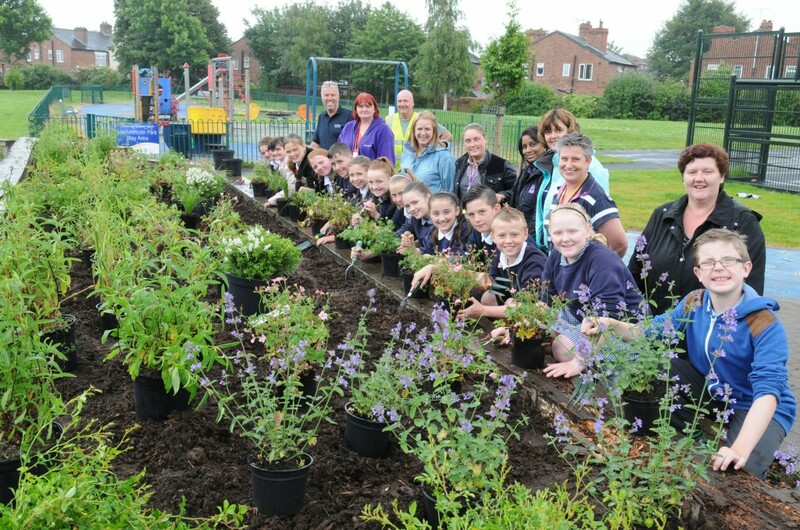 1 July 2014 – Pupils from Westminster Community Primary School have taken part in a planting activity in Ellesmere Port’s Westminster Park in time for the summer holidays. Works to improve play and leisure facilities for park users were completed earlier this year and included the provision of new toddler play equipment and enhancements to sports facilities with an extension of the tarmac pitch and the installation of a second goal to enable team sports to be played at the park. Executive Member for Culture and Economy, Councillor Stuart Parker, said: “I am delighted that this very worthwhile project is now completed and hope the community who helped shape the scheme can now enjoy the space. Local member, Councillor Pat Merrick, said: “The improvements for Westminster Park have come as a direct result of local residents sharing their community’s ideas and I’m delighted to see local children get involved in finishing the project. Peter Jones from Plus Dane Housing Trust said “We were really pleased to support this project and involve local young children in the implementation of it.